My daughter is organising a party for four year olds with an Under-the-Sea theme. Her son had decided he wanted to be an Octopus. I had already felt a bit unsure about this, but Esme had suggested we stuff four pairs of grey tights. I was pondering what sort of size of tights would work, and if I might use buttons for suckers when this email and photograph arrived. I would like to make this outfit, can you help please? I think its an adorned bib over matching colour clothing. How much fabric and what type will I need? Does it have wire in the tentacles? Suddenly my “dressing up outfit” concept was looking a bit lame. This was lamé! Silver, shiny, blingy. I thought back to Demented Fairy’s ten posts about making a steam punk outfit. I suffered some mental paralysis. 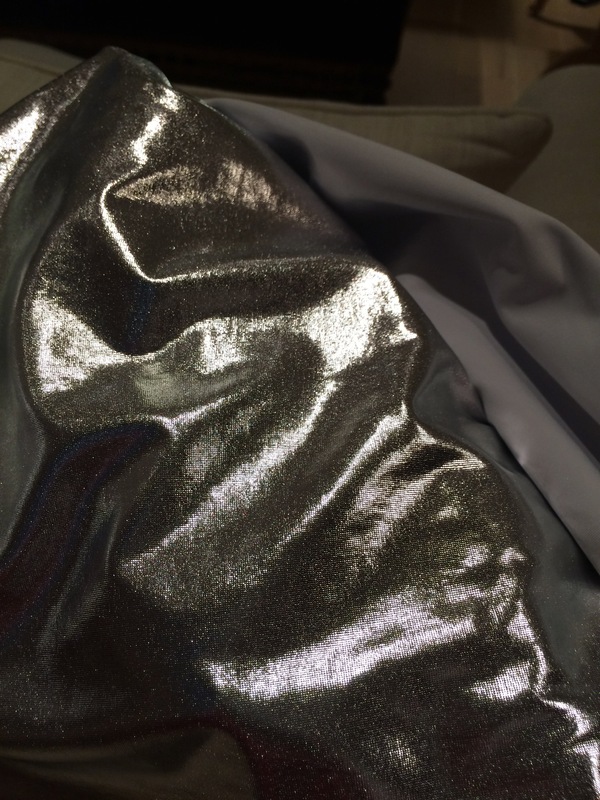 I couldn’t even answer the question – how much fabric do I need? The next day Esme told me she had bought 2 metres of this, from John Lewis. I hope this will do. And some silver leggings. And some stuffing. Last night she cut out and stitched the tentacles, giving me half a yard to make the yoke. Once you look at the picture it is not so very complicated. 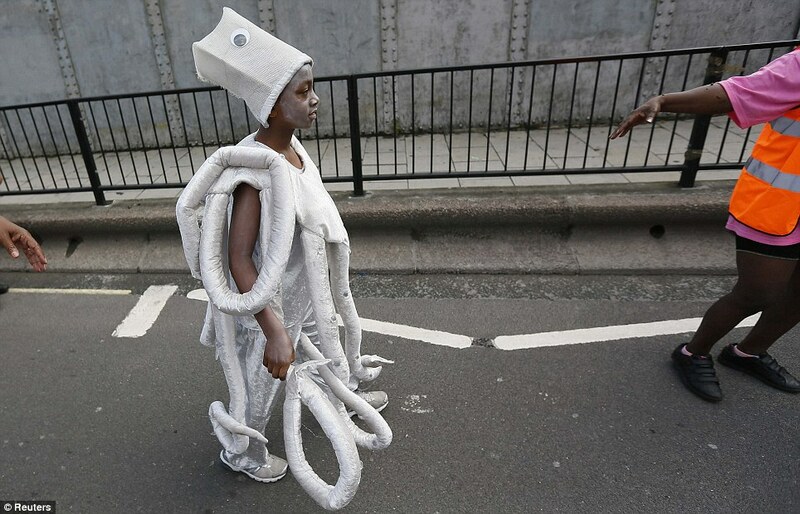 There are around 8 tentacles, stuffed, attached to a yoke-bib which is also padded, and arranged (rather than wired, I think) so they don’t drag along the pavement. Then there is a mask or hat. In my first notion I had a hood in mind. Let’s see how we get on. This reminded me of the film “Love Actually” and the line “The octopus costume’s taken me months. Eight is a lot of legs, David.” Hope it won’t take you quite as long. How funny, the things we do for love. Can’t wait to see it. Looks like fun! (I’d have bought three and a half metres though, unless child very small or fabric very wide). Good luck! Sounds like you’ve got it sussed, but just popping in to say Burda actually had a pattern for an octopus costume a few years back. Theirs was a bit nightmare fuelish though – the silver one is much nicer. Oh looks great fun. Enjoy. That is quite a costume! Good luck with the copy – I’d go with a hood I think. Hope we get to see the final version. Hah- I thought of Love Actually too! Now that I know there are lame octopi, I may start scuba diving! When my younger son was litttle, he was all about comfort. So all of the costumes I made for him were based on sweatshirts and sweatpants. He was an awesome little Elvis one year. A 70s elvis with a silver metallic cape and a sequined applique on his chest. I too would have chosen to be an octopus! This is one of the cutest things I’ve ever seen! I liked to dress up as a skunk for many years, because of the big, swishy tail with the white stripe. I don’t know why I never thought of an octopus! Good luck, K.
I had never considered an Octopus either. But then a can’t say a skunk was front of mind either. Oh my goodness, how fun! Much more involved than the pirates and bobby-soxers of my day. Can’t wait to see this silver octopus with as yet undetermined number of arms! I’m fascinated with Stephanie’s liking to dress up as a skunk for many years…..I do so hope this was as an adult as well as when a child? And of course the silver octopus is fantastic, who WOULDN”T want to dress like that? I love making costumes. It would thrill me if one of my kids wanted to be an octopus. When I make costumes for the school plays the children think I have super powers. Of course my daughter is totally unimpressed by my sewing but her friends are amazed.